Kasumi is a 15 year old who attends Sei High School. She's not necessarily the kind one. She's always saying the wrong thing or she's making cracks on her friends or bothering them to oblivion and back, but she's always got some kind of escape for whatever trouble she gets in. She's got black hair and black eyes (Almost like Ryo-chan, weird ne? I know at one point it use to be brown and brown. Like my parents swear their hair is brown. BAH! It's black.) She's got one helluva boyfriend, Kayowai Kitsune. He's no peach, like he said to Tora. But in the end, they do make the perfect couple (*snicker*). Kasumi says this to transform into Sailorzeus. Raising her henshin stick (which is pink with a green star on it), bolts of pink (yes, pink!) lightening crash all about her, creating her fuku. This is Sailorzeus' only attack. An antenna raises out of her tiara and collects lightening, then she throws her hand out towards the target, electrifying them. 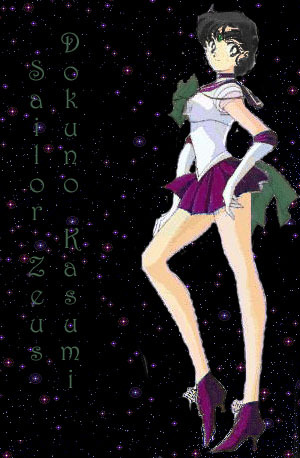 Kasumi OR Sailorzeus says this to transform into Super Sailorzeus. Same transformation as before, but with arm shields. This is Super Sailorzeus' only attack. Again, the antenna raises and begins to collect thunder. But it's bright thunder, really bright and as it hits the target, not only does it electrify them, but it blinds them too. Kasumi OR Super Sailorzeus says this to transform into Eternal Sailorzeus. Same transformation as before, but with guarded arm shields and a longer back bow. This is Eternal Sailorzeus' defensive attack. As always, the antenna raises, but she does too, and clenching her fists outwards, lightening begins to rain on the target. This is Eternal Sailorzeus' offensive attack. Sparks begin to flare in her tiara and she spins, and they fly out at the target, shocking them badly. This attack, unlike most senshi attacks, does not assist the Senshi.